Online delivery of best wishes along with this Beautiful Fresh Heart Shape Red Roses Premium Arrangement for your dear ones. Send someone this soulful floral gift and there will be no mistake that youre giving them your heart. A heart made entirely of 75 Red Roses and Rose Buds filled with Green Leaves. 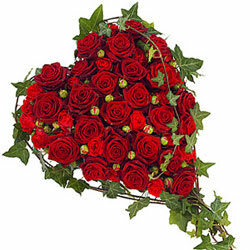 Online delivery of best wishes along with this Beautiful Fresh Heart Shape Red Roses Premium Arrangement for your dear ones. Send someone this soulful floral gift and there will be no mistake that youre giving them your heart. A heart made entirely of 100 Red Roses and Rose Buds filled with Green Leaves.